Last October, our Founder, Karolyn Hart, was invited to talk to the 200 developers that came together at the Samsung Create! conference. When InspireHUB was founded in 2013, it was immediately retained by the Mandela family to help use technology to fight the pediatric healthcare crisis in South Africa. We eventually morphed to help corporations with their communications. 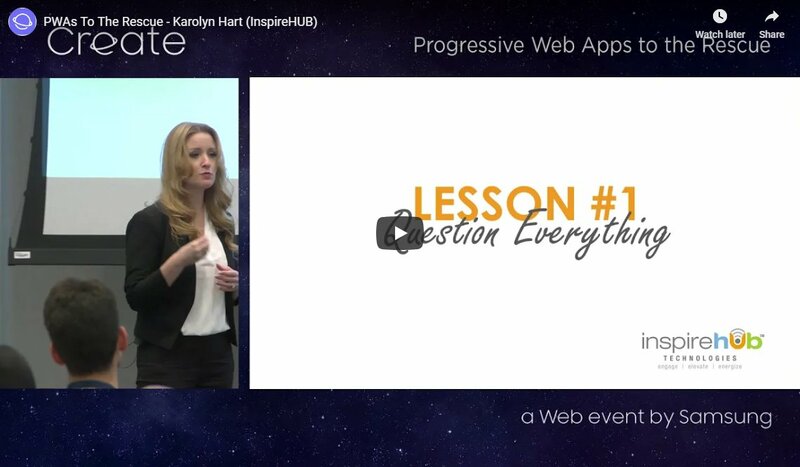 In this talk, Karolyn shares the story of how Progressive Web App technology came to the rescue for InspireHUB clients, what the team learned about using bleeding edge technology and how a small, unknown, scrappy group of devs ended up being the first to do a whole lot of cool stuff. Grab a mug of something hot and lean in for 20 minutes of fun and inspiring storytelling about what it's like to be a rogue band of developers at the beginning of a technology the world had yet to adopt, from an "Aha! moment" in the back of a cab in Nairobi as our first customer helped inform future design, to the teachable moments that helped pave the way for some of consumer technology's most valuable shifts today.